You guys! 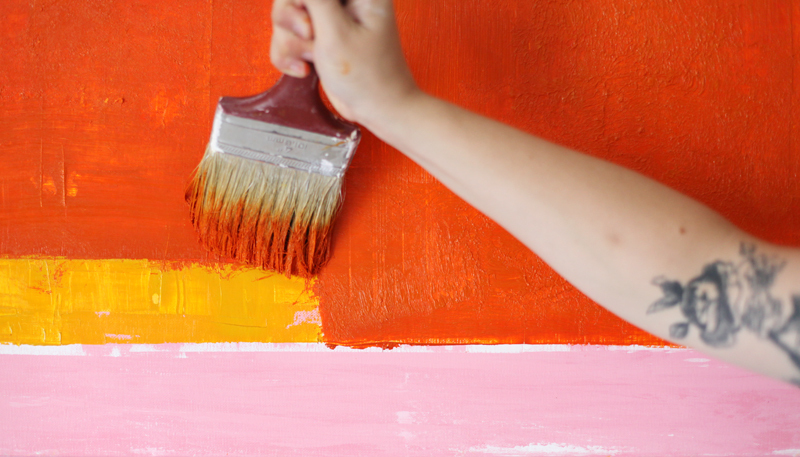 I think all of the paint fumes around here are starting to get to me. I built a glitter countertop for our dining room. What could make that an even crazier prospect? 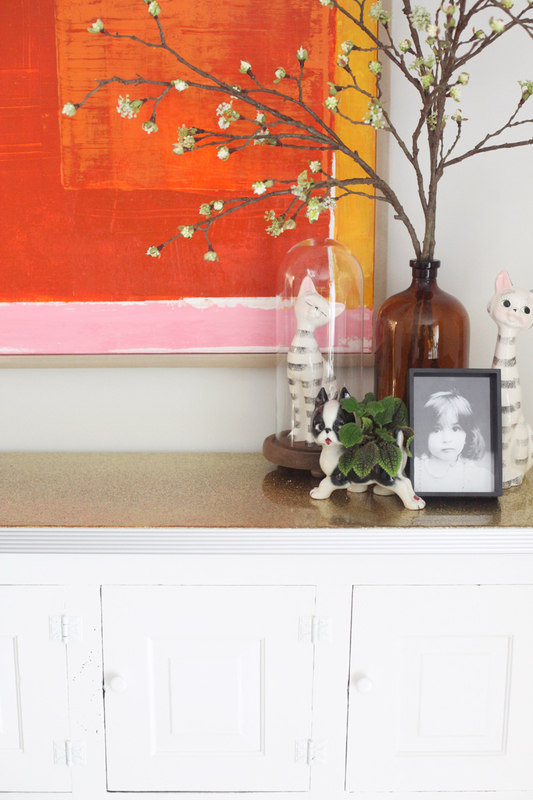 Well, we are knee deep— no, make that eyeballs deep— in home renovations over here, and I decided it would be fun to build a glitter countertop right at the beginning of all the chaos! Phil and our dads are working on replacing the ant infested eaves of our home and also the gutters, while we’ve simultaneously been working on renovating our entire kitchen! So much good stuff for our house— so much bad stuff for my sanity. Anyway, amidst the planning for the new kitchen, I stumbled across a favorite antiques dealer of mine who was finally selling an old cabinet of his I had been eyeing for years! I had always sighed longingly at it when it was just an overstuffed display fixture at the antique mall, thinking about how perfect it would be to store all of my craft supplies out of sight in our dining room (my workspace). He gave me a deal for $300, so I immediately put it on layaway, then a month later brought it home. The problem with the cabinet was, well… nothing as far as I was concerned. But I guess the fact that it had part of its front and all of its sides and top missing might have become an issue down the road. So I had to get out my saw and drill and finish the cabinet out with some new wood that completely clashed with the beautiful, old patina of the cabinet. It was a travesty, as you all bemoaned alongside me, but my friend Kyle helped me paint it a fresh coat of white, remove the broken glass knobs, and replace them with new ceramic ones. 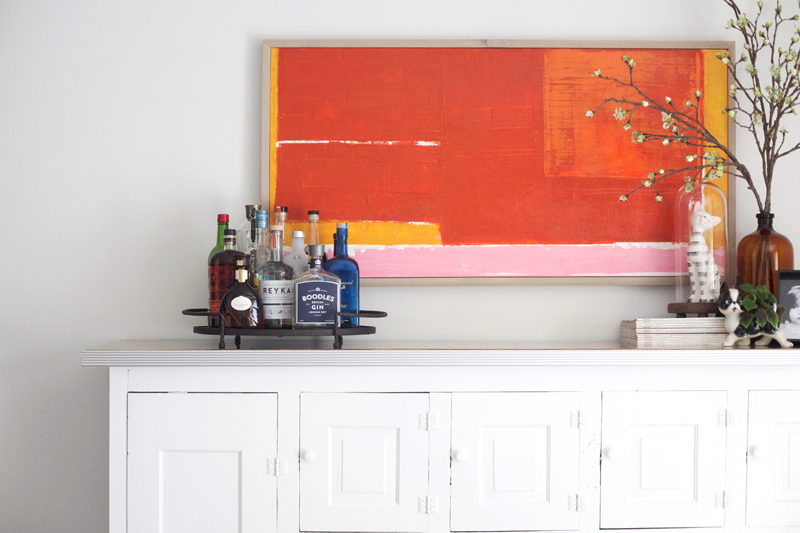 All it needed was a countertop! I figured I could buy some lumber to frame out a new countertop similarly to our office countertop, so I headed off to the lumber yard. While I was there, inspiration struck. I thought— Hey, what if I made the countertop like a retro diner table top? Some funky laminate on top and aluminum banding around the edge? 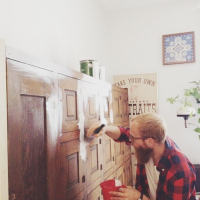 That would add the perfect amount of quirkiness to the beautiful antique cabinet! Of course, they didn’t have any laminate that fit the bill, nor any aluminum banding. So my DIY become a wee bit more complicated, but infinitely more fun! Did I tell you there were buckets of glitter involved? I built the countertop just as I had done in our office, and painted it a lemony yellow for an undercoat, in case any glitter didn’t cover certain spots, then the yellow would camouflage the mistakes. I’m glad I did that, because when I look closely at it now, I can see spots of that yellow paint showing through. After the countertop was built and painted, I got to work on the glitter. I decided to use an epoxy resin with glitter stirred in to give the countertop a durable finish with a transfixing, dimensional sparkle to it. I used this epoxy resin which was a bit cheaper than others I had seen out there, and it worked great! 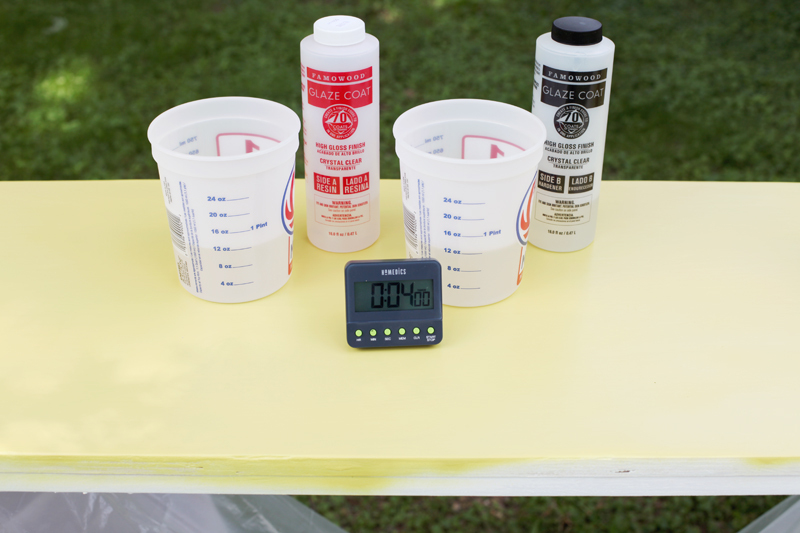 To make the epoxy resin, you have to mix the resin with the hardener. The proportions must be exact, so I used plastic measuring cups that I could dispose of later. To begin, you mix equal parts of resin and hardener, stirring vigorously and constantly for four minutes. Then you transfer the mixture to a clean container and stir again for 4 minutes. Before stirring again, I quickly dumped the contents of my glitter bottle into the resin, then stirred. After the last four minutes of stirring was complete, I poured the epoxy resin onto the countertop and spread it out with a wide painter’s edging blade. You supposedly have 20 minutes to work, but I found that it began getting tacky sooner than that, so I worked quickly. Because I was planning on putting aluminum banding on the edge, I let the epoxy run over the edge. I wish I had covered it with duct tape, though, because I ended up having to sand away the drip marks to get my banding to sit flush with the edge of the counter. Duct tape would have just peeled off after about an hour or so of letting the resin set up, and then I wouldn’t have had any drip marks on the edge. After spreading the resin, I sprinkled the top with glitter to cover any areas of yellow showing through. 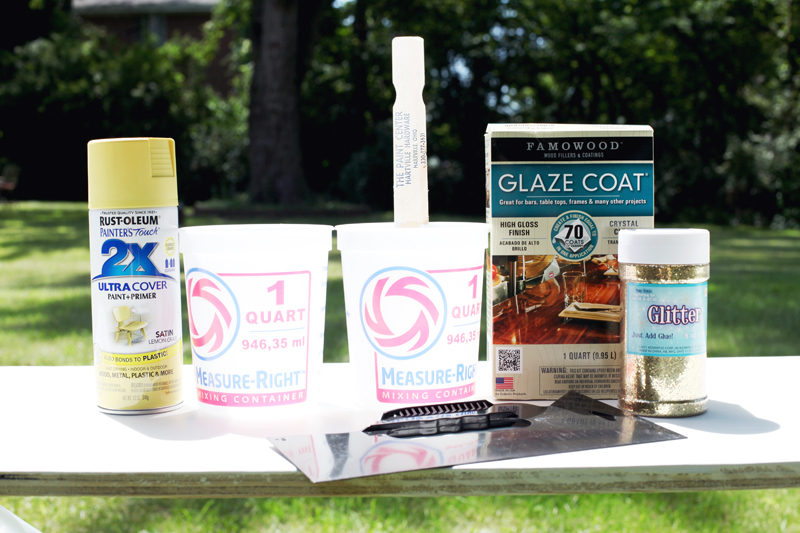 This prevented my epoxy resin from creating a shiny, glass-like surface, though, so the next day I decided to do another layer of epoxy resin and glitter. I’m so glad I did! It made all the difference. Note: Do not pour your epoxy resin outside like I did! I got bugs in mine that I had to cut out with a blade. Most of the divets I made with the blade were filled in after the second coat of epoxy resin I did inside our house. But pouring inside was difficult because I had to make sure the toddler was nowhere to be found and that there was plenty of cardboard on the floor to catch drips. Because our house was basically under construction, I left the countertop alone for about three weeks before working with it. It was a good idea to let it cure that long because of the two coats of resin I had done extended the curing time quite a bit. (I would set something onto the counter and have to pull hard to get it off because it was bonding with the resin!) So this week, the aluminum banding I had ordered from Outwater (ALU7777 on this page) came in, and Phil helped cut slits into the edge of the counter so we could attach the banding. We used a skill saw to cut the grooves and I applied construction adhesive to help the banding stay in place. I love the way it turned out! The cabinet top is significantly higher than standard height (It originally was mounted as an upper cabinet/locker in an old store— hence the no sides or top thing. ), so you can’t see the glitter until you are next to the cabinet, but you can see the beautiful aluminum banding, and I think it plays well against the more traditional feel of the cabinet itself. It’s a nice surprise, though, when you go over to the cabinet to make a drink, and BAM! 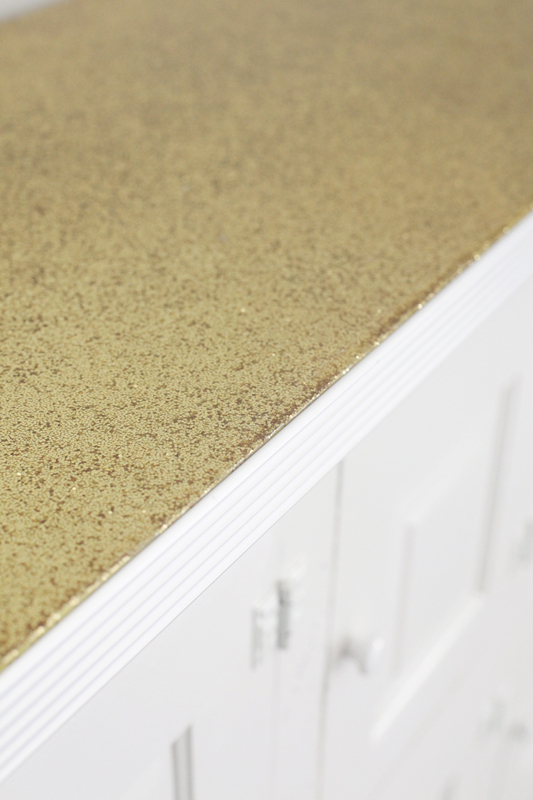 There’s a glitter countertop! Talk about a conversation starter! Oh, and P.S. 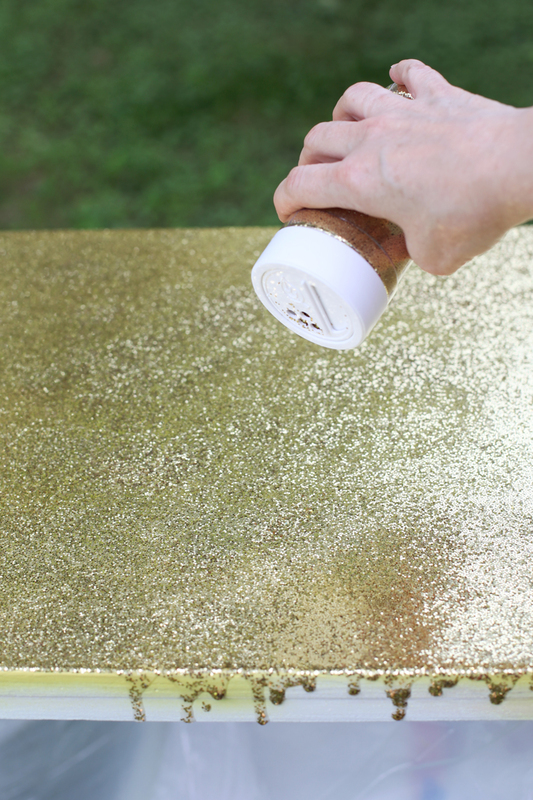 Maybe you’re not really into the idea of a glitter countertop or tabletop, but check it out! I made this abstract painting last week! It was my first time really attempting anything like this since art school, and even then, I had never done anything in this style. I shared my process over at A Beautiful Mess right here, and you can see how I framed it right here. I hope you all are doing well! I’m hoping to get back to more regular posting within the next week or so. Thanks for checking in on me! As always, you can see me in between posts here by checking out my updates at A Beautiful Mess! I am obsessed with this!! 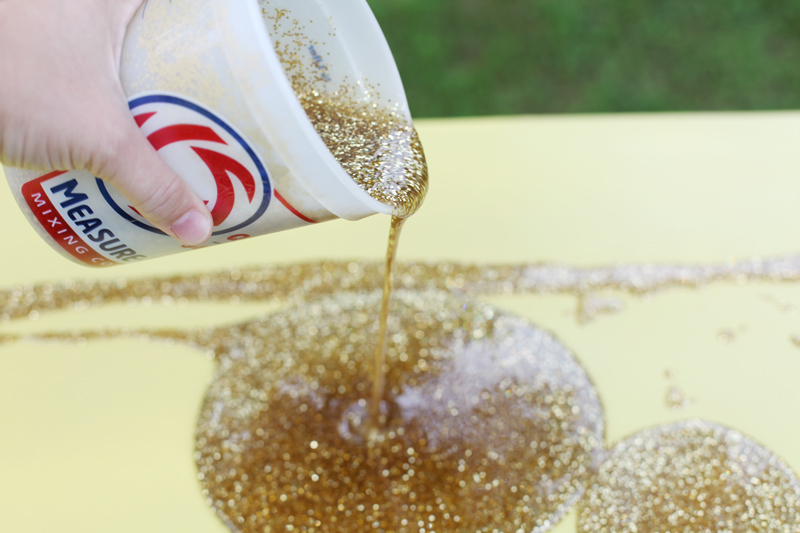 there’s nothing better than gold glitter. OMG! I need to try this! Thanks so much for the tutorial! so, this is really weird, but i found you in a google search for the “try a little tenderness” crewel pictures that you posted years ago on your old site. a friend is desperate to find it for her daugher’s nursery. any chance that you’re sick of it and interested in selling? really? YAY! my friend will be so excited! 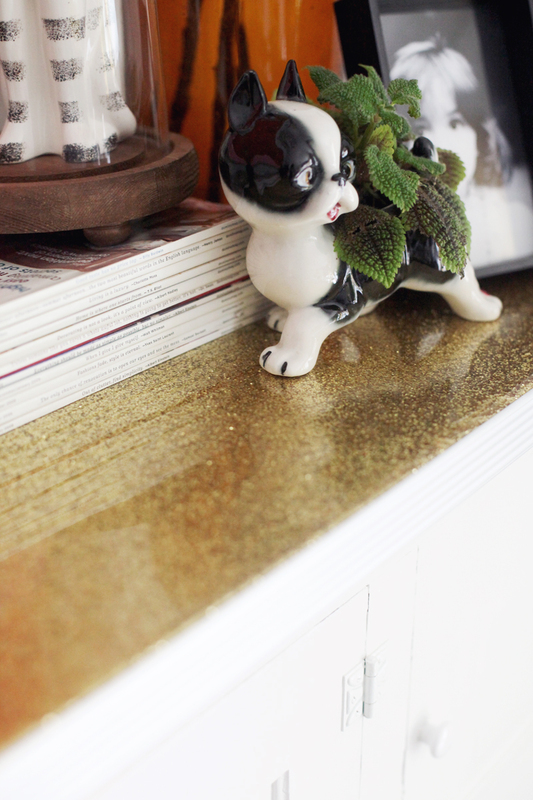 Anyone who isn’t into a glitter countertop doesn’t have their priorities straight. This is my dream. Thank you! I adore this project, your resourcefulness, and the little puppy planter. Thanks for sharing with us! OMG this is so amazing. I was going to do this with my counter tops with sparkle vinyl fabric! 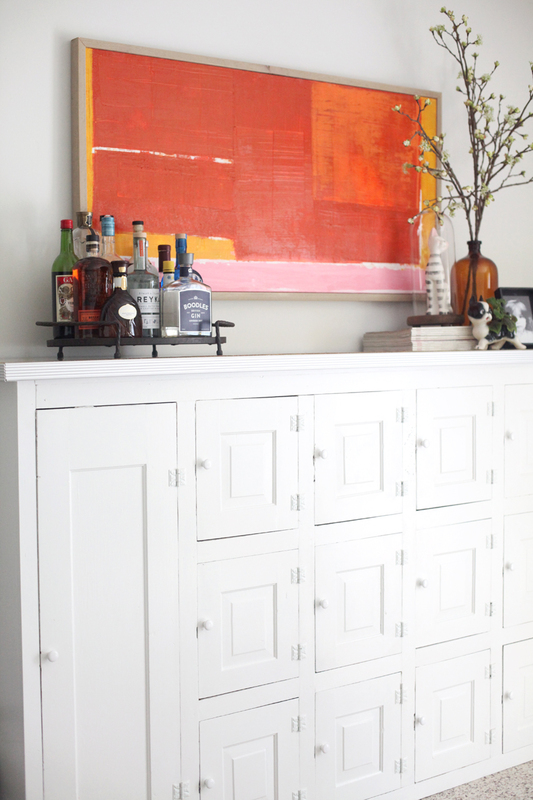 I luv that cabinet! what a deal!! This is stunning! Thank you so much for sharing. I can’t wait to try this myself! I LOVE this idea!! It turned out fantastic!! Ahh I love this! 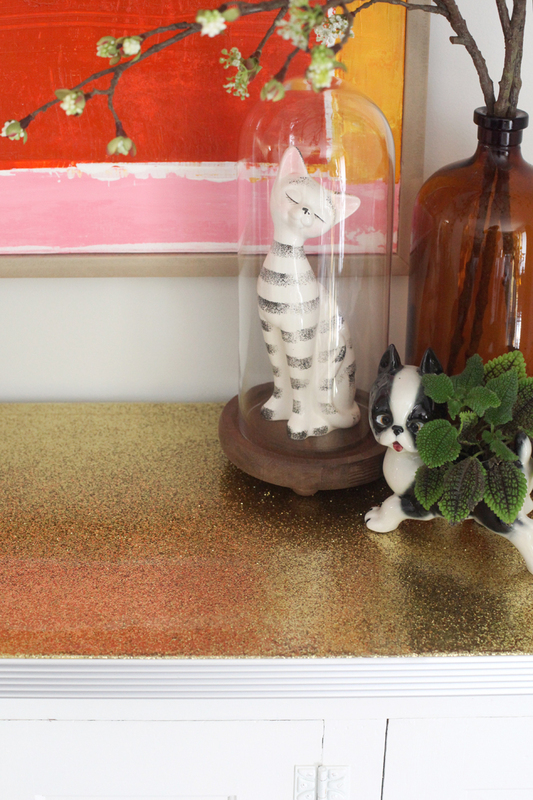 I wish my husband would let me do a glitter countertop, my mantle would be perfect. It’s from a local antique shop. I am insanely jealous of this! What a great idea!!!!!!! This is so fabulous! Do you think it would work alright for a kitchen counter? I’m not sure. I got the idea because I had seen another DIY countertop where they did a faux marble paint job and covered it with epoxy to seal the paint. I would think if you didn’t do many layers (like just stick with one) of epoxy it might be okay. If you do more than one layer of epoxy, it takes forever to cure! It would show scratches if you cut on it, but if it was between covering up old counters with this process or scrapping them, I would at least try covering them up first. Amazing. Jaw dropping…glitter me timbers AMAZING. i really never thought of glitter this way. beautifull!!! I love it! I want to do this to my kitchen counters. Do you think it would stand up to the abuse? Thanks for the tips! I think that over the years, the epoxy could get scratched looking if you’re using it in a heavily used kitchen. 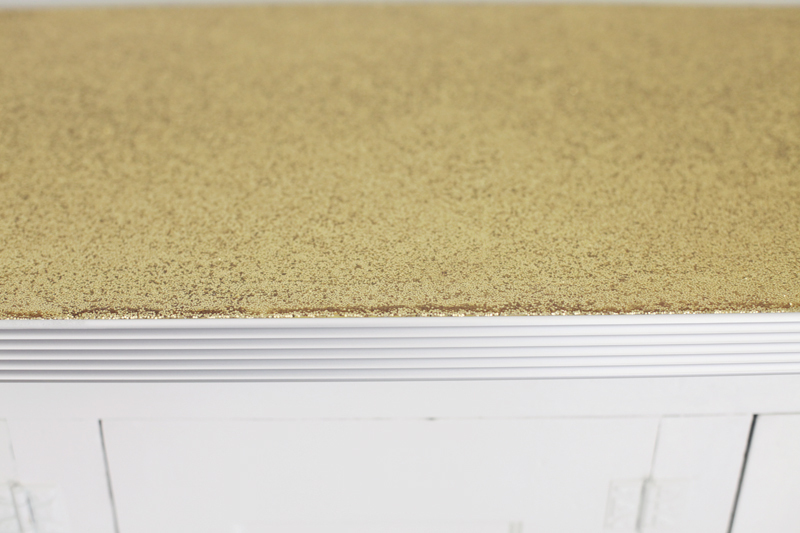 Have you ever been to a restaurant with epoxy topped tables? You might notice it looks a little cloudy from frequent use and washing. Just finished doing my kitchen counters. I added black cement powder into my concrete mix to make a charcoal gray color and poured in a heavy dose of black and silver glitter. I’m so stinking excited! No more green laminate counters. 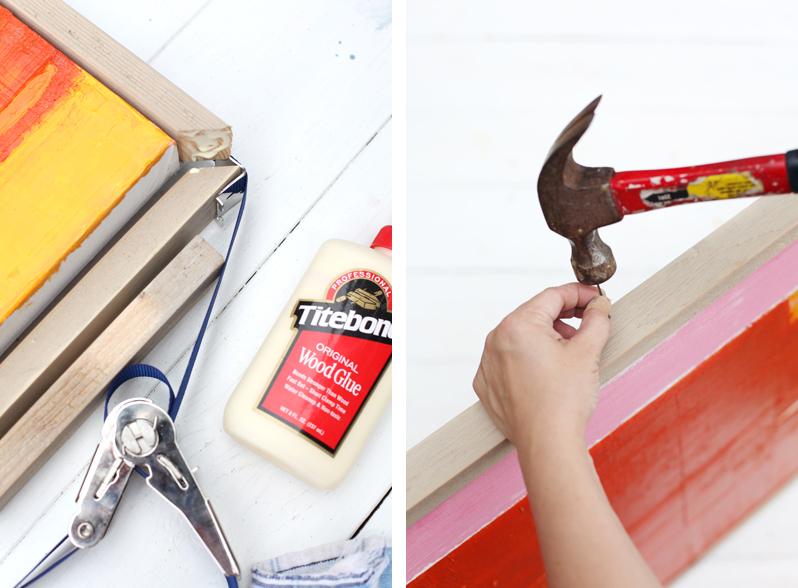 Just know that working with epoxy can make a big ole mess….tape and cover any and everything! I’m not sure what your question is. I explained what I did pretty thoroughly, but if you have a specific question, I would be happy to answer you. I love your glitter countertop. It looks fantastic. I think I’ll try it with the resin glitter on a cheap toilet seat. If it works it might be worth Re-doing on a thicker better quality seat. Create my own golden throne! Thanks for the idea. I own a nail salon and I want to use this method for a storage cabinet. Do you think it will take 3 weeks to dry if I only use on coat of the mixture? Also is there anything else that will give it that shine? Thanks! Definitely wouldn’t take that long. I’d check the manufacturer’s instructions, but I’d say you’d be good to go in around 48 hours, or maybe just 24 hours. I forget what the instructions were in the epoxy I used, but it was a day or two for one coat. This would be gorgeous in a nail salon! Do you think the resin would stick to foam board? I wanted to do the glitter resin as the back and some white wooden letters glued on it…..
I’m pretty sure it would stick to foam board, but I would double up the foam board, because the resin might weigh it down more than you want, maybe causing it to bend. Good luck! Hi there…I realize this is an old post, but I am just starting to explore the world of epoxy..I love Famowood by the way. 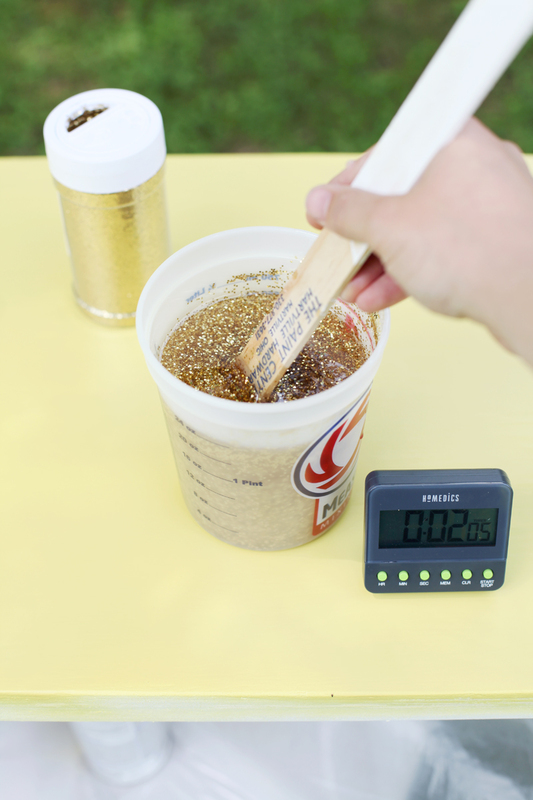 Would you happen to know the ratio of glitter to epoxy you used. Did you use a full container per pour? I am just wondering if there would be a point where the epoxy wouldn’t cure properly if too much glitter is added. Love what you did by the way! I LOVE IT! JUST CURIOUS ABOUT THE METAL BANDING. WHERE DID YOU PURCHASE THAT? Great web sitewebsite! It looks extremely expert! Sustain the good job!